Yoda keeps lead in Kisei S League: Yoda Norimoto 9P has maintained his undefeated record in the top league, the S League, of the 40th Kisei tournament. In a game played on July 9, Yoda (B) beat Takao Shinji 9P by half a point. Yoda is now 3-0. On July 16, Kobayashi Satoru 9P (B) beat Yamashiro Hiroshi 9P by resignation to pick up his first win (to two losses). Yamashiro has the same score. In another game, played on July 23, Yamashita Keigo 9P beat Murakawa Daisuke Oza by resig. Yamashita goes to 2-1 and Murakawa to 1-2. Progress report on other leagues: In the A League, Kono Rin 9P has the sole lead on 5-0 with two rounds to go. The only other players in the running are Ichiriki Ryo 7P and Cho Riyu 8P, who are both on 4-1. In the B Leagues, Awaji Shuzo leads the B1 League with 4-2 and Yamada Kimio 9P leads the B2 League on 5-1. In the C League, which is a Swiss System, four players have unblemished records after three rounds. They are: Akiyama Jiro 9P, Han Zenki 8P, Yo Seiki 7P, and Kyo Kagen 3P. In the fourth round, Akiyama will play Han and Yo will meet Kyo. Only one player from this league can join the irregular knock-out tournament for league-winners; to win the league, you have to win all five games, so they are the only ones still in the running. 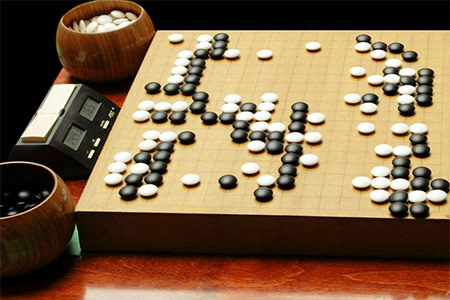 Cho Chikun repeats in Fumakira Masters: The final of the 5th Fumakira Igo Masters tournament was held in the Ryusei Studio in the basement of the Nihon Ki-in in Ichigaya, Tokyo, on July 11. Taking white, Cho Chikun 9P (l) beat Takemiya Masaki 9P by 5.5 points to win this title for the second year in a row and for the third time overall. This is an official title, so it takes Cho’s record tally to 74 titles. Takemiya was disappointed to miss this opportunity to win his first title for 20 years. Go Seigen elected to Hall of Fame: The 12th selection meeting of the Hall of Fame Awards was held at the Nihon Ki-in on July 21. Go Seigen (r) was the unanimous choice of the 12 committee members in attendance. There were eight nominees, chosen on May 25 by the nomination committee. Each member can vote for three persons, and the support of two thirds of the members is the qualifying condition. This is the first time since the election of Dosaku that a nominee has been supported by every member.